Dean Deter, part of the research team for ORNL’s first autonomous bus, pictured with GROVER at the National Transportation Research Center. Dean Deter has a knack for what he calls “tinkering.” A self-proclaimed gear head, Deter grew up around computers and cars, satisfying his curiosity to understand how anything with an engine or hardware works. “As a kid I would spend hours in the garage with my buddy’s dad and grandfather who owned hot rods, rebuilding engines and cars,” he remembers. That ability to get lost underneath a car hood serves him well in his role today as a researcher in ORNL’s Vehicle Systems Research Group and coordinator of the Vehicle Systems Integration (VSI) Laboratory. A native of South Bend, Indiana, Deter came to East Tennessee as a middle-schooler, relocating so his dad could begin a career at ALCOA. When he graduated from high school, his family decided to move back to the Midwest but Deter chose to make East Tennessee his home and enrolled at the University of Tennessee (UT) to study mechanical engineering. The opportunity to complete an internship at ORNL, first as an undergraduate intern working in the Fuels, Engines and Emissions Research Group and later as a graduate student (UT) in the VSI Lab working on controls, led to a full-time researcher position after graduation. Even with his previous knowledge, Deter said taking over the leadership position was at times trial by fire. “This is the great thing about ORNL though – if you are a self-driven person here, there’s lots of opportunities to really take control of the research and contribute,” he said. For the past six months, Deter has been contributing to transportation research in a big way. He and a team of researchers have been devoted to understanding an unusual type of vehicle—ORNL’s first autonomous bus, named GROVER (Ground-based Robotic Omnidirectional Vehicle for Electric-mobility Research). In Fall 2017, Deter and fellow researchers were tapped to figure out how to make GROVER not only autonomous, but also able to see obstacles and navigate around them. They were working within an accelerated timeframe: the pair had to demonstrate GROVER by March 2018, a mere few months after accepting the challenge, and make it ready for its public debut during the ORNL 75th Anniversary Lab Day open house in early June. The 3D printed GROVER is a small 12-passenger shuttle bus that operates on a platform originally built for the Navy to move munitions on aircraft carriers. The platform is designed to make tight turns and rotations and has four wheels that operate independently of each other, rotating a full 360 degrees, allowing movement in any direction—even sideways. Next-level work on GROVER will include machine vision and machine learning applications. GROVER is unique in that it provides the ability to test sensors and controls, batteries, and power electronics all in one platform, giving researchers full control. “GROVER gives us that vehicle to test anything we want, safely and efficiently,” Deter noted. 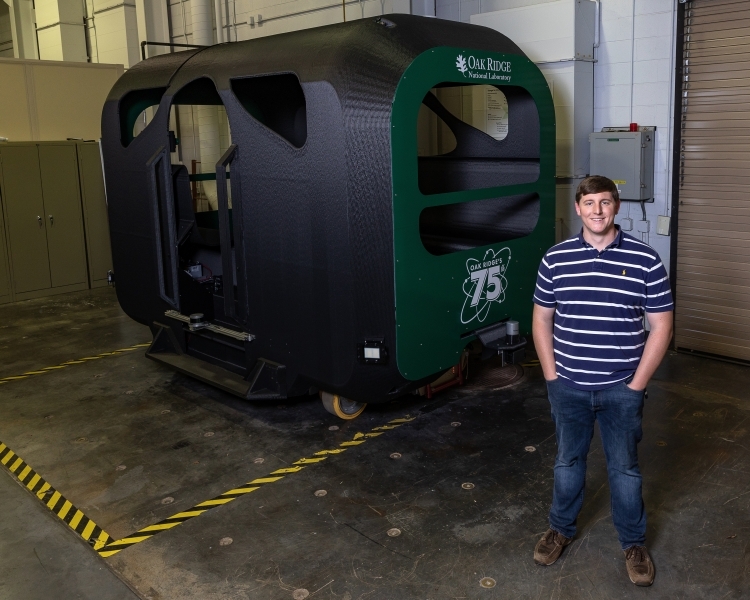 GROVER and other ORNL 3D-printed vehicles such as the Shelby Cobra and the Printed Utility Vehicle are also road-ready tested in the VSI Lab. Using “hardware-in-the-loop” technology, virtual vehicle environments are created to simulate how the engine or motor would perform on the road. The VSI Lab can accommodate a wide range of platforms, from light-duty vehicles such as the Cobra to heavy-duty trucks with electrified powertrains. Deter says that the VSI Lab is beginning to create a full virtual road environment that can simulate all scenarios— such as speed limit changes because of road construction and traffic lights. The father of a young family with two toddlers, Deter builds and races cars as a hobby. He’s built engine parts for race cars on the regional level and recently has been working on parts for a national race.